With a 2019 investment, Oregon could make meaningful progress toward offering universal voluntary home visits to new parents who need and want additional support in their first few months home with a new baby. While expanding home visiting services to all infants and families is a new idea in Oregon, home visiting has a long history in the state. 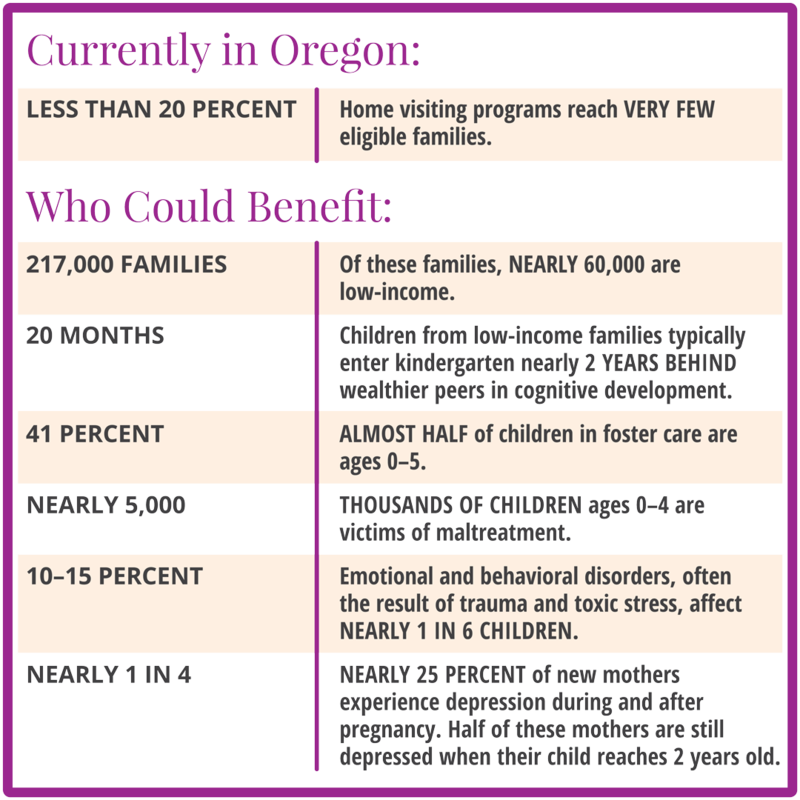 The Oregon Legislature created Healthy Families Oregon (originally Healthy Start) in 1993 to provide home visiting services to first-time parents. Since then, the state has worked to strengthen the program with federal dollars and created the Best Beginnings Committee with a goal of creating a cohesive home visiting system. Home visiting services provided through Healthy Families Oregon and numerous other state- and locally-funded programs currently reach 12,000 families across the state. This is, unfortunately, less than 20 percent of families who could benefit. We aren’t the only state who understands the value of Home Visiting services. As part of their ongoing “What’s Working” series, CBS This Morning looked at the impact of Family Connects, a universal home visiting program that has served 30,000 families in Durham, North Carolina. 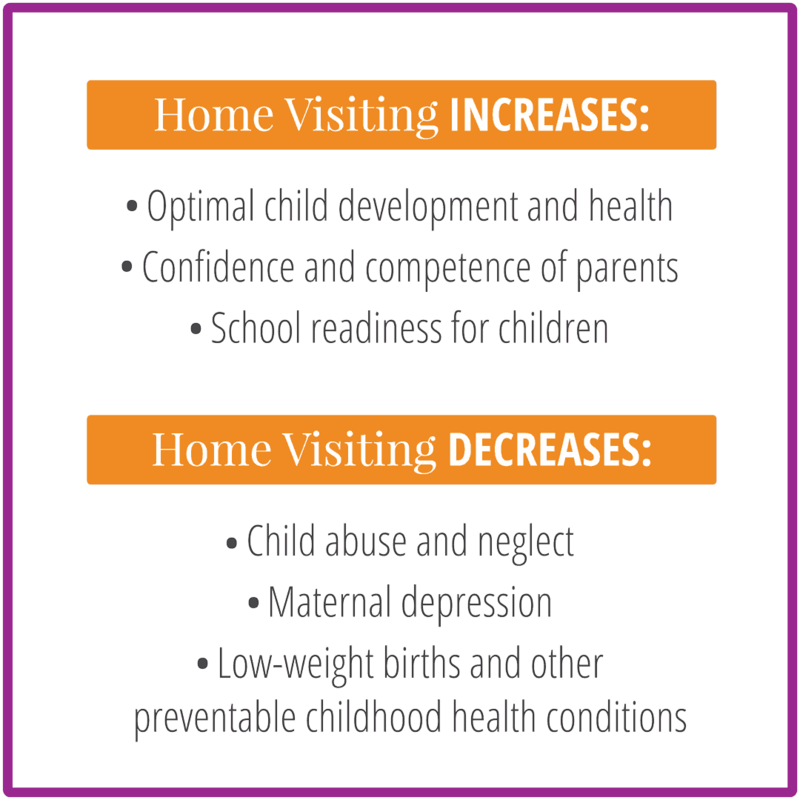 Home visiting has been proven to increase optimal child development and health, the confidence and competence of parents, and school readiness in children. It decreases child abuse and neglect, maternal depression, low-weight births and other preventable childhood health conditions. As the video below highlights, home visiting has also reduced medical costs, ultimately saving the state money. “Having a new baby at home is stressful for everyone, regardless of income,” she said. “It’s a time of life when most anybody needs some help.” The idea of home visiting being universal throughout Oregon would be good, Braun said, because not everyone has the same easy access to a pediatrician or a hospital. As Oregon’s population becomes more ethnically and linguistically diverse, culturally specific home visiting has also become increasingly necessary. For families who live in rural communities, the challenge of receiving vital home visiting services is further complicated by the lack of access to home visitors and increased driving time and costs. In this interview on Think Out Loud, State Senator Elizabeth Steiner Hayward explains why she’s co-sponsored the bill that would make voluntary home visiting services available to all parents of newborns. “I was married. I was a physician. It was a planned pregnancy. My husband was a successful father already. I had everything going for me, and yet I still had this completely common biologic occurrence of having this depression, and it would have been incredibly helpful to have a trained nurse come in and help me,” she said. In this podcast, we visited Ha Mi Da and her family at her apartment in Southeast Portland. Ha Mi Da came to the United States from a Burmese refugee camp several years ago and we wanted to learn more about her story, her involvement with home visiting services provided by IRCO, the Immigrant and Refugee Community Organization, and her hopes and dreams for the future. Many thanks to Mihaela Vladescu, the family’s home visitor with IRCO and Healthy Families Oregon, and Min Sein who provided interpretation services during the visit. 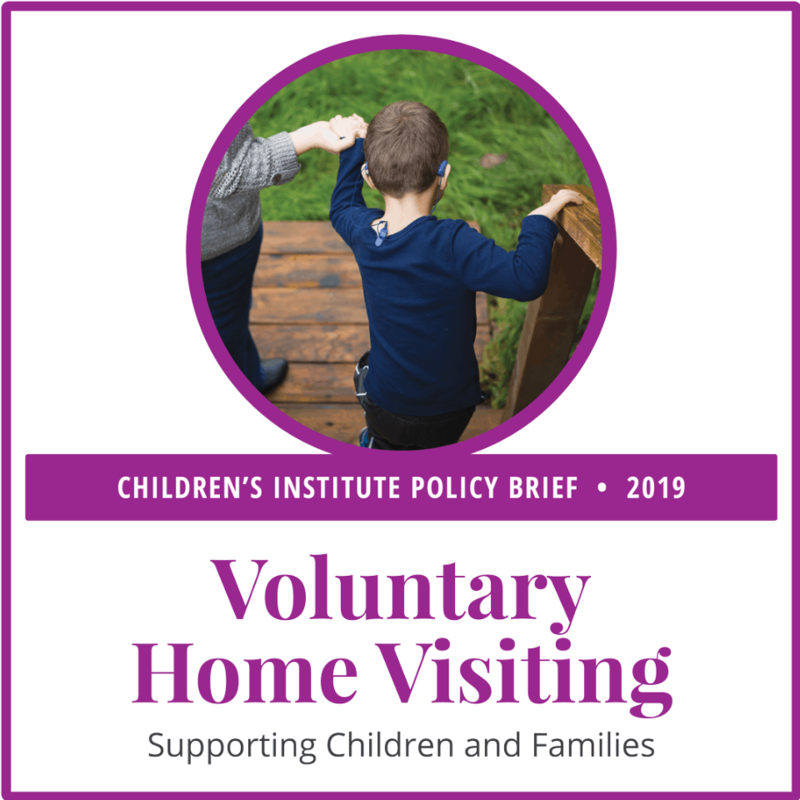 Our policy brief on home visiting focuses on promoting loving, nurturing relationships between parents and children and the role of home visiting programs across Oregon. Our 2019 policy recommendations for the state include offering universal home visits for all families and further investing in programs that strengthen parent-child bonds. The Administration for Children and Families and the Health Resources and Services Administration within the U.S. Department of Health and Human Services recently released the results of a multi-year study of the Maternal, Infant, and Early Childhood Home Visiting (MIECHV) program, which confirms lessons learned for states and communities working to continually improve the outcomes of vital, federally-funded voluntary home visiting programs. This study looks at the crucial work being done in communities nationwide to identify family needs and implement and improve home visiting programs to make a difference in the lives of families with young children. Improved home environments: Families participating in home visiting provided more cognitive stimulation and emotional support to their children. Reduced frequency of psychological aggression towards the child: Parents participating in home visiting were less likely to yell, scream, or swear at the child, or call the child names. Fewer child emergency department visits: Children whose families participated in home visiting were less likely to go to the ER for injury or illness, perhaps due to improved preventive care, reduced incidence of child maltreatment, or a better understanding of when an ER visit is needed. Fewer child behavior problems: Children whose families were enrolled in home visiting were less likely to show aggression, act out, or demonstrate hyperactivity; they were also less likely to present with anxiety, sadness, and social withdrawal. Gentler guidance: Parents enrolled in home visiting were more likely to motivate and encourage their children in a positive manner than to assert power over children to accomplish a task. Reductions in experience of intimate partner violence: Mothers enrolled in home visiting were less likely to experience physical or sexual violence or battering. Reductions in parental depression: Parents enrolled in home visiting were less likely to exhibit symptoms of depression.